Any RTS player that wants leopard print on their tanks should take a look at End of Nations. Trion brought an MMORTS devleoped by Petroglyph called End of Nations to E3 that could be something a little different for RTS fans. Petroglyph is made of up RTS veterans that have been working on the genre for over 15 years, starting on titles like Command & Conquer and having touched Lord of the Rings: Battle for Middle Earth, Star Wars: Empire at War, and other notables. End of Nations is an MMO of sorts, but it also has an expansive single-player campaign. This is where you'll gradually learn how to play the game instead of being thrown into a PvP match with the best 14-year-old on the planet. The game is set 50 years in the future and focuses on the Liberation Front and its battle against the oppressive Order of Nations. Players can pick their faction, and then also a class. The real meat of the game for most players will probably be End of Nations' Living Battlefield, which is a map that shows where all of the individual battles in the world are occurring. It notes if they're PvP, a tutorial, etc. Players can jump into a battle at anytime, but Petroglyph will make sure you can't spawn into a PvP game and take the win at the last second. Persistence on the Living Battlefield comes in through battles that take place over cycles. At the end of the cycle, which may last a month, the participating players will receive rewards and the cycle will reset. Guilds, clans, and individual players will want to get their hands on these rewards. Maps support 26 v. 26 players. 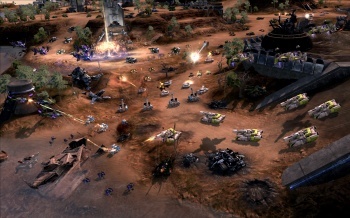 Players create their army beforehand and do not build it in the map. An army is fully customizable right down to the design of each individual unit. If you want a leopard-print attack helicopter, and another painted like a lily, you can do it (no joke). Parts of each unit will be customizable too with End of Nations' mod system that'll give them more power as they're upgraded. The goal of a game is to destroy the enemy's command center. Once your army is on the field, you deal with cash as the only resource. Cash gradually trickles in when you capture specific areas on the map. Buildings each have very specific tasks such as a defense factory and the power plant that keeps it charged up, which could lead to high-level tactics. Every unit has its own individual abilities that can turn the tide of war. For example, one unit can dig in and increase its view in the enemy's fog-of-war, which could be used to a player's advantage by then calling in a superpower right in the enemy base when he's unaware that one is even possible. Superpowers are special attacks such as missile strikes, nukes, wandering gas clouds, EMP attacks, railguns, etc, and they require lots of cash to use. The game is still somewhat early, but Petroglyph talked about other interesting additions such as a possible 50-player battle against enemy AI. A "raid" in an RTS game sounds like it could get very interesting. RTS fans looking for something with more persistence and personalization should keep their eyes on End of Nations. End of Nations is being developed for the PC.